If your garage door won't open or close, spring repairs may be in order. The opener controls and initiates the movement of the automatic door. The garage door springs serve as the muscles. Without them, opening the door can be hard and dangerous. Due to the tension the springs are under, performing repairs or replacements requires skill and experience. Leave it to the nearest pros. Garage Door Repair Yonkers provides fast fixes for spring problems on Sunday through Saturday same day response basis. There are two types of garage door springs - torsion and extension. Each type enables the door to open and close and will cause problems if as they wear out. You can locate the torsion spring above the garage door. There's often only one unless it's a very large and heavy door. The extension springs, which are smaller in size, can be found on either side of the door. They are always two of them. Each garage door spring type works in very different ways. Torsion springs wind and unwind. They use torque to help the door rise and load with tension as it lowers. Extension springs stretch to load up with tension and contract to help pull the garage door up. There are variations, of course. Galvanized torsion springs, for example, are suitable for different needs. They're coated with zinc to protect them from rust. This makes them great for high moisture areas. Oil tempered torsion springs don't need lubrication. They're very strong and durable and can last longer on heavier door panels. The size and length of a garage door spring also vary according to the size and weight of the door they need to support. The bigger it is, the bigger they'll need to be. Should a spring become extended or compressed beyond its capability, it will stop working effectively. This is incredibly dangerous with garage door springs. The flexibility and durability of these units are invaluable. Without these qualities, the springs can’t raise the door. 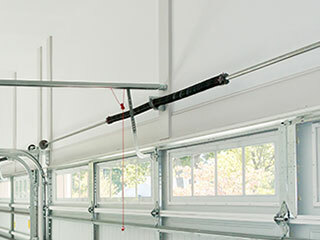 Finding a nearby source for garage door spring install and repair services is vital. Some issues can wait to be handled, but not these. Spring tension adjustment should occur every so often, as should lubrication. This type of maintenance is good for making the garage door springs last longer. If an overhead door spring broke you need urgent help. Leaving the door in this condition means trying to open it will be dangerous. You should avoid doing that. Garage Door Repair Yonkers provides emergency broken spring repairs to all the nearest areas, including Mount Vernon and New Rochelle. Seeking a nearby source for help is important. Broken spring repairs should be done as soon as possible, to minimize damage and risk. Neglecting this type of problem is not a good idea. The longer you wait, the bigger the likelihood of more damage occurring. Get in touch with us for same day assistance from garage door spring repair professionals near you. From tension adjustment to complete spring replacement. Any service you need is readily available and close to you. Whether you live in Tuckahoe or near the Eastchester area. Garage Door Repair Yonkers offers its services throughout Manhattan, so know that you can always call us for same day repairs. It’s often we get a call saying the garage door springs broke. But as often as it happens, that’s as often as we succeed in fixing the problem at hand. Worn garage door springs will make the door move slowly. A lot of noise and weak or stuttering movement are also indicators of potential issues with these units. If the garage door doesn’t open all the way, opens a little and then stops or can’t stay in place, call us. Worn or broken spring problems are nothing to trifle with. Get them checked and fixed by local pros ASAP. Garage Door Repair Yonkers is availabel Sunday through Saturday. Contact us anytime.